for reasons that may be obvious to some readers, i finally got around to dusting off my copy of duck hunt and giving the game a concentrated burst of attention. i pretty much hadn’t played the game since i was a kid (so, more than 25 years ago), although i’d actually tried to play the game years ago (i know i’m not the first person who was bummed out to find out that the old light-gun games don’t work on modern TVs). fortunately people in my neighborhood have been getting rid of ancient TVs fairly regularly so i’ve had one for a while (untested), and fortunately when i hooked my NES up to it, it worked perfectly. w00t! i played the most commonly available release of the game which was the dual cart that included the original super mario bros., although apparently a single-game cart was also released, along with the 3-in-1 game version that included the power pad compatible world class track meet. 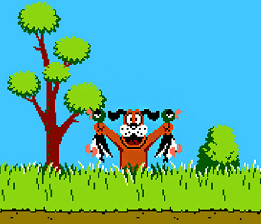 the game has three modes: two classic modes feature the infamous duck hunt dog in all his “giggling at you for missing” glory. the first of these features just one duck at a time, and you have three shots to hit it. for each round you have to shoot 6 of the 10 ducks with higher levels featuring faster-moving ducks and higher requirements (e.g. hitting 7 of 10 to progress). in the second mode you have to hit two ducks with three shots. and in the final mode you have to shoot clay discs which are tiny compared to the ducks, and which become smaller as they move off to the distance. even with the time i’ve spent playing wii, which has much more sophisticated pointer-tracking capabilities, this blast from the past was actually surprisingly fun, much more fun than i expected. 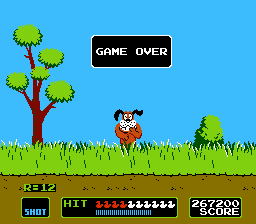 although i’m an animal lover, the game doesn’t take the hunting aspect too seriously: the dog sports a wide grin at each success and the hit ducks, instead of having X’s for eyes, look at you with narrow-eyed disdain. the physicality of the zapper makes scoring hits supremely satisfying (i think there must be some deep-rooted, primal hunting instinct that’s causing the strangely strong response), and being limited to three shots for each stage makes for a significant but satisfying leap in difficulty between the main two modes. the lack of character in the clay discs mode is a bit of a drawback and its increase in difficulty isn’t quite as satisfying, but perhaps it was added to make parents feel a little more comfortable with playing a “kid’s game”. the responsive and accurate controls make all the modes fun, with a good degree of challenge. apparently starting at level 20 you can’t miss any targets to continue, which seems a bit overly demanding, that’s acceptable for an early video game. all in all this was a game that, somewhat surprisingly, still holds up today. the game was so solid and well designed that i was somewhat tempted to add it to my “greatest games of all time” list, but i don’t think it inspires a need to play it for hours on end and i don’t know that i’ll be yearning to play it that often, so it doesn’t quite make the cut. but i’m definitely looking forward to playing through the other light gun games on NES (and other systems) much more than i was before. – video of awesome predecessor of this game by nintendo and from 1976, featuring a projector and a light gun. nintendo’s use of the technology dates back even further than that, and nintendo.wikia.com has a cool entry about their first foray into light gun based games, from 1973.